No one sneaks into the Catholic Church. I absolutely love this aspect of becoming a Christian in the Catholic Church. Let me explain. I was raised in a Pentecostal Protestant denomination (International Church of the Foursquare Gospel). 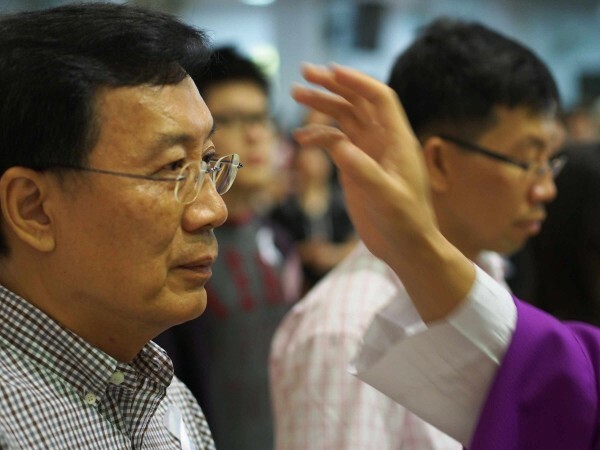 In some ways, Pentecostalism is closer to Catholic doctrine than Reformed Protestantism, but there is a major difference in how people become Christians. To become a Christian in the church of my youth, a person (let’s call him “Bob”) might have an experience like this. Upon being invited to church, Bob would hear Christ-centered praise and an expository sermon on a biblical text. At the end of each service, an appeal to become a Christian would be given. In doing this, the pastor would invite the congregation to bow their heads and close their eyes — no looking. Then he would ask those who wanted to receive Jesus Christ as their Lord and Savior, for the first time, to raise their hands. If Bob wanted to respond, he would publically raise his hand and the pastor would invite him to silently repeat a simple prayer of belief in Jesus. As a child I always wanted to peek to see who raised their hands. I was fascinated that people were responding to Jesus for the first time, and I wanted to see who they were. I always wondered why we were not allowed to know who had just been “saved.” As a result, I never met the new Christians of my Church unless they freely divulged this information in conversation. Bob might have attended for one Sunday or twenty, but following the hand-raising response, there was no assessment of what he believed or understood. There was also little to no personal follow up and formation. Bob was simply invited to keep coming to Church. The RCIA process in the Catholic Church is notably different. We march people in front of the liturgical assembly several times before they are fully initiated: the Rite of Acceptance, Rite of Sending, Rite of Election, and three times during the Easter Vigil! Catholicism emphasizes the public profession of faith and the consequent prayerful presence and affirmation by the community. While there are stark differences between the respective Pentecostal and Catholic understandings of salvation, many do not realize that the Catholic Church teaches that, objectively, the process of salvation begins with a public profession of faith, long before baptism. According to the Church, there is a profound transformation that takes place within each person in this public profession during the Rite of Acceptance. This transformation depends upon two essential catechetical milestones that prepare for the Rite of Acceptance. If these two milestones are lacking, the inquirer will not have the necessary disposition to allow the rite to bear its intended fruit. The rite will objectively take place, but its fruit in the life of a new catechumen will be stunted. In the precatechumenate, which leads up to the Rite of Acceptance, the kerygma (the basic gospel message) is thoroughly presented. [i] Lectionary based catechesis is insufficient for the precatechumenate because the inquirer needs the complete basic gospel before he or she can respond in faith to Jesus. Once an inquirer completes the precatechumenate and proceeds through the Rite of Acceptance, there is a substantive change in this person’s relationship to God and the Church. The Church documents help us understand this change. This is a bold statement by the Church. Although this idea has a rich history, this teaching is largely unknown to many in the Church and a large proportion of Protestantism. After the Rite of Acceptance, due to catechumens’ explicit desire to receive baptism, along with their repentance for sins and living of a life of charity, the Church, “assures them… salvation” if they die before receiving baptism. [v] This demonstrates God’s great love for us and underscores the truth that God’s salvation is pure grace. This is a profound statement, always held by the Church, but made clearer at the Second Vatican Council and in the Rite of Christian Initiation and made explicit in the Catechism of the Catholic Church. [vi] This affirms the power and value of the pre-baptismal profession of faith and life of charity. While this is far from “faith alone” salvation, it clearly asserts that the public profession of faith is saving, when accompanied by charity, as one looks forward to baptism. God is our Creator and in him all living things have their existence. He enlightens our minds, so that we may come to know and worship him. He has sent his faithful witness, Jesus Christ, to announce to us what he has seen and heard, the mysteries of heaven and earth. This is the first concrete step towards sacramental incorporation into Christ and is a moment of profound transformation in the lives of the candidates. As long as catechumens do not leave the process, they will be objectively saved in the waters of baptism. If catechumens die before arriving at those waters, they will be saved by their explicit desire, as evidenced by their faith and life of charity. Whether they are in the catechumenate for three months or three years, the Church “embraces them as her own.” If they leave the catechumenate, however, they are no longer “assured” of their salvation. I wonder how many Protestants would be surprised to hear that the Catholic Church teaches that in the Rite of Acceptance, the public profession of faith in Jesus, along with the life of charity, is a saving act. I wonder how many Catholics would be surprised. This does not take away from the necessity of baptism but helps us more fully understand the mercy of Christ and the entire process of salvation. Salvation is not a one-time event in a prayer, nor is it a one-time event in baptism. It begins in faith, made objective in baptism, and must be preserved until death. In many ways in the Catholic Church we see the Scriptures fulfilled that say, “If you confess with your lips that Jesus is Lord and believe in your heart that God raised him from the dead, you will be saved” (Rom 10:9) and “He who believes and is baptized will be saved (Mk 16:16a). Far from salvation being a one-time event, St. Paul is clearly aware that salvation is a process as he says, “For the word of the cross is folly to those who are perishing, but to us who are being saved it is the power of God” (1 Cor 1:18). In the Catholic Church, we do not keep our eyes closed as we witness our brothers and sisters make their public profession of faith. Thankfully, we know that all those who make this profession are responding to the full Gospel and we want to celebrate this significant moment with them and support them with our prayerful presence. [i] See Rite of Christian Initiation for Adults (RCIA), arts. 7, 38, 42. [ii] Cf. RCIA, art. 42. Also see “Conversion: Laying a Firm Foundation in the Precatechumenate” The Sower, Vol. 35.3 (July 2014), for a more complete explanation of the significance of the kerygmatic proclamation and cultivation of initial conversion to the RCIA process. This article may be found online at Catechetics.com. [iii] Lumen Gentium, art. 14; also cf. RCIA, art. 47, and Catechism of the Catholic Church, no. 1249. [iv] Cf. RCIA, art. 47. [v] Cf. Catechism, no. 1259. [vi] See Lumen Gentium, art. 14; Ad Gentes, art. 14; RCIA, art. 47; Catechism, no. 1259. [vii] See RCIA, art. 52. Drake McCalister is Coordinator of Catechetical Practicum in the Office of Catechetics at Franciscan University and is the director of RCIA for the parishesof Steubenville. Previously, Drake was a Pentecostal pastor in the International Church of the Foursquare Gospel for thirteen years. He resigned from his pastorate and brought his wonderful wife and daughters home to the Catholic Church on December 12, 2004—the Feast of Our Lady of Guadalupe. This article was originally on pages 16-17 of the printed edition.